Well known names such as Kjetil Mørland and Carina Dahl and talented newcomers will compete in this year’s Norwegian final. Today, the acts fighting to represent the country in Tel Aviv, Israel in May, were presented to the public. On the 2nd of March, Olso Spektrum will host the Norwegian MGP final. For the 5th year in a row Kåre Magnus Bergh will host the show, this time it will be together with singer and actress Heidi Ruud Ellingsen. 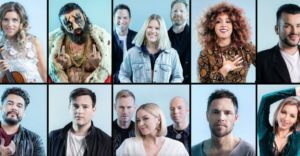 After many speculations the past few weeks, broadcaster NRK today finally presented the acts and their songs for this year’s national final. As usual it is a mix of well known names and new comers with a chance to shine and kick of their career, who will compete for the honour of representing Norway at the 2019 Eurovision Song Contest. The songs can all be heard on NRK’s website. Since their first appearance in 1960, the Norwegian Eurovision history has been quite a mixed journey. The country won the contest three times, but finished last a total of 11 times, of which four was without any points at all. Bobbysocks secured the country its first victory in 1985 with the song La’ Det Swinge. 10 years later, Secret Garden and their almost instrumental Nocturne repeated that. The last Norwegian victory came in 2009 where Alexander Rybak charmed Europe with his Fairytale. Last year, he once again represented his country. That’s How You Write a Song came 15th in the final, after winning its semi-final. Alexander Rybak isn’t far from the only artist from Norway to do a Eurovision comeback. Many artists have represented the country on two or more occasions: Nora Brockstedt (1960 and 1961), Kirsti Sparboe (1965, 1967, 1969), Hanne Krogh (1971, 1985 and 1991), Anne-Karine Strøm (1974 and 1976), Anita Skorgan (1977, 1979 and 1982), Jahn Teigen (1978, 1982 and 1983), Elisabeth Andreassen (1982 – For Sweden), 1985, 1994 and 1996), Ketil Stokkan (1986 and 1990) and finally Alexander Rybak (2009 and 2018). In the video below, a little treat from Mr Rybak: Fairytale in Fado style, with an orchestra of students at Metropolitana de Lisboa, Portugal. ← Eurovision 2019: A Friend In London boys in competition in Tel Aviv?